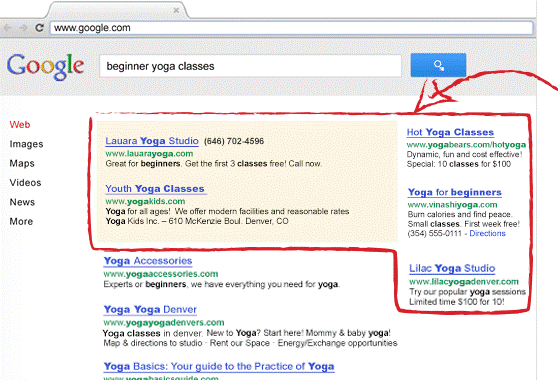 On February 22nd and 23rd, Google rolled out a change to the way that Adwords ads are displayed on search results. As a publisher you might not think that this affects you since it’s a paid search update, but that couldn’t be further from the truth. This change has significant implications for CTR on organic results. Below we describe the change and show you some examples of how the change affects the traffic to your site. 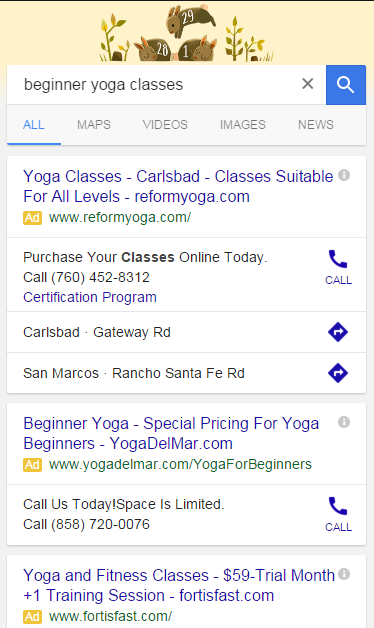 In the past, Google would sometimes show the highest bidder or two above the organic search results and the remaining advertisers would be shown in the sidebar alongside the organic search results (shown below). Often, no advertisers would be bidding high enough to show above the organic results and there would only be sidebar ads. This meant that most of the clicks went to those websites that ranked high organically. With the new change, Google has completely eliminated all sidebar ads and is now showing all paid ads directly in the search results – often with as many as four paid ads showing before the organic results. The effect on organic clicks can be devastating. Here is what the new search results page looks like. As you can see, on desktop, the top organic result is pushed way down to the bottom of the page on my large monitor and completely off the screen on smaller ones. 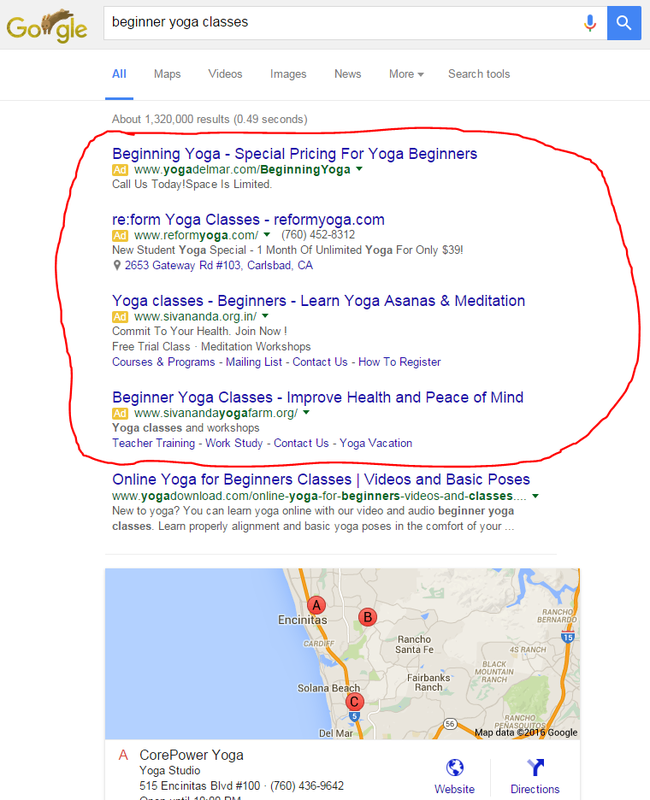 On mobile devices, the organic search result is completely off the screen. This is very bad for publishers. What does this mean for you? FEWER CLICKS and LESS TRAFFIC. Here is an example of single search term where a site ranked first on a single term. It’s CTR (click through rate) dropped from 35% to 11%. The number of clicks it received dropped from 1,200 per day to 400. Meanwhile, it’s ranking / position has not changed – it’s still ranked “#1” – of course #1 in this case actually means fifth since 4 paid ads show above it now. How can you tell if you’re affected? The best way to determine if your site has been affected – and how much – is by using Google webmaster tools. Using the Search Traffic -> Search Analytics report you can compare date ranges and look at the results for changes in CTR. What can you do if you’ve been affected? 1. Google Knowledge graph displays publishers content directly in the search results so visitors don’t have to visit your site but can still view your content. 2. AMP pages allow Google to host your content and limits your options for which products you use and functionality you offer. Google products work, but most third-party tools do not (e.g. mixpanel, other ad networks, etc). PreviousWill Blocking Ad Categories Effect AdSense Revenue?